I’ve always loved the holiday season. I grew up in a household that celebrated Christmas and Hannukah, so the month of December was always fun! There was lots of good food and friends and family to share it with. 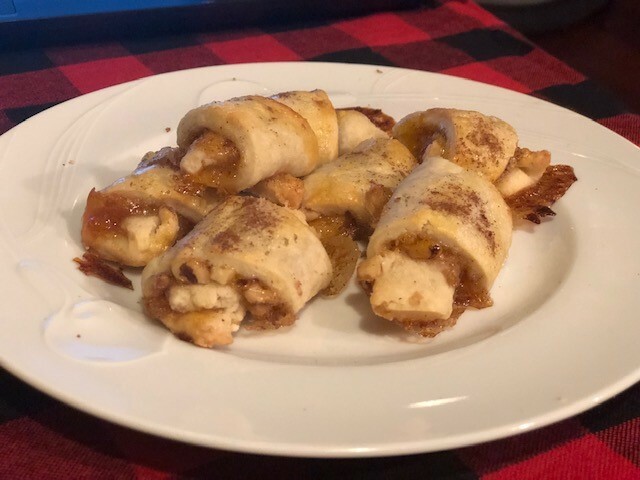 Holiday baking in my house included the usual suspects like sugar cookies and shortbread press cookies, and a pumpkin date bread that was always a hit, however the apricot rugelach were always among my favorites. 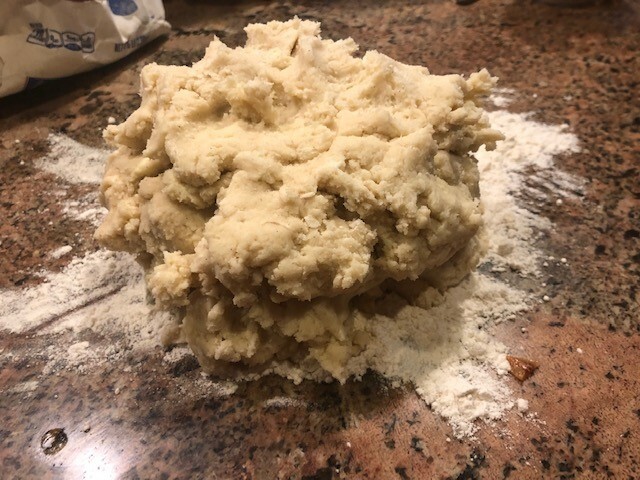 Rugelach can be made with sour cream or cream cheese doughs (or with no dairy if keeping parve), but in my house, it was always cream cheese. Fillings are where things really get fun. They range from chocolate to jam, nuts to raisins, marzipan to poppy seeds – the options are endless. I never knew there were options until I left for college, because in my house, my dad always insisted they be apricot, no nuts, so my mom never deviated from that. 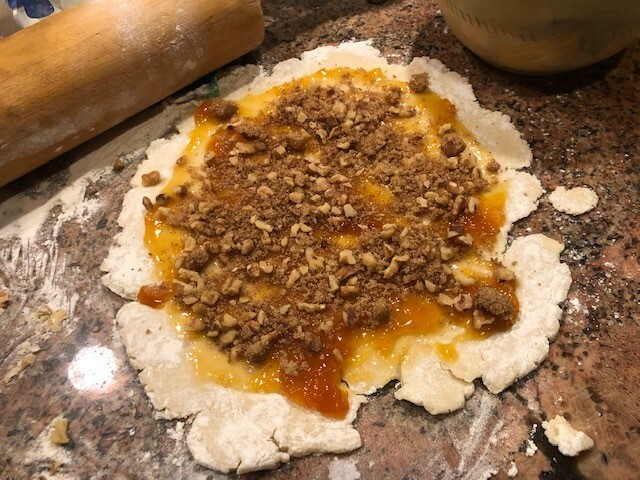 He’ll be disappointed to read this and know that I’ve gone nuts (literally) and added some walnuts into the mix (sorry, Dad!). 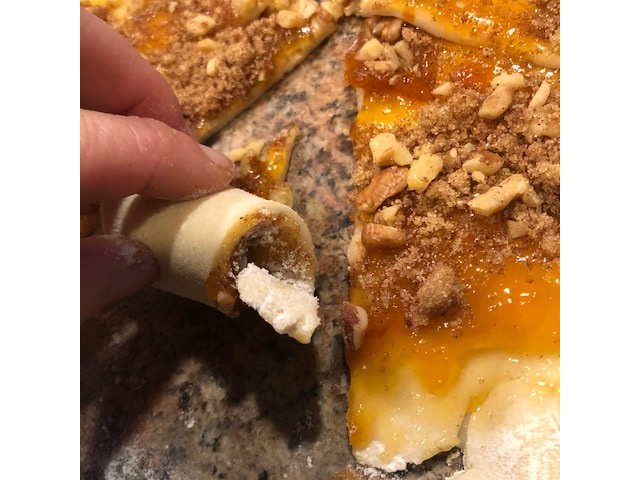 Rugelach are super easy to make, so they’re also a great option when baking with kids. 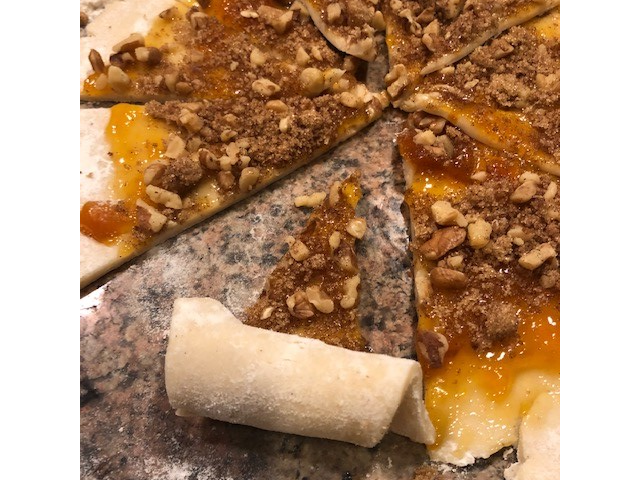 I love that I usually have most of the ingredients on hand, and can change up the filling depending on my guests. The dough does need to chill, so don’t expect to mix and bake right away. 1. Cream the cream cheese and butter in an electric mixer until light and airy. 2. Add sugar, salt, and vanilla, and mix to incorporate. 3. Add in flour until just combined. 4. 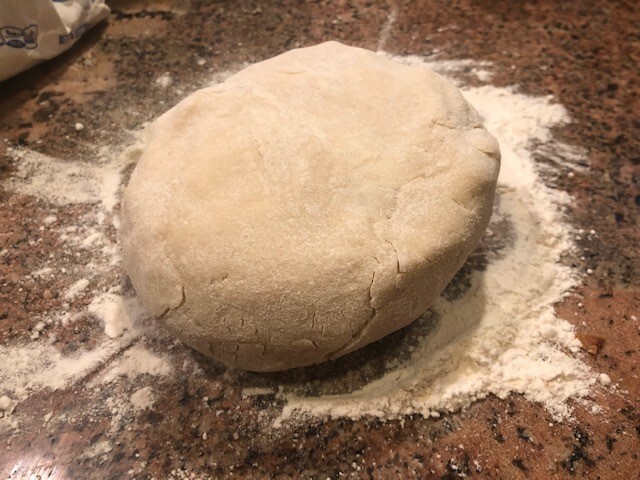 Roll dough into ball on floured surface and cut into quarters. 5. Wrap each piece in plastic and chill for at least 1 hour in the refrigerator. 1. Combine brown sugar, cinnamon, and walnuts. 2. 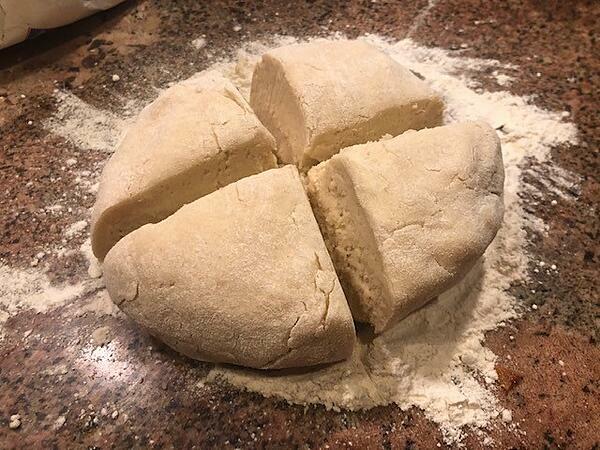 Flour your cutting board or surface and roll each quarter of dough into an 8 inch circle. 3. 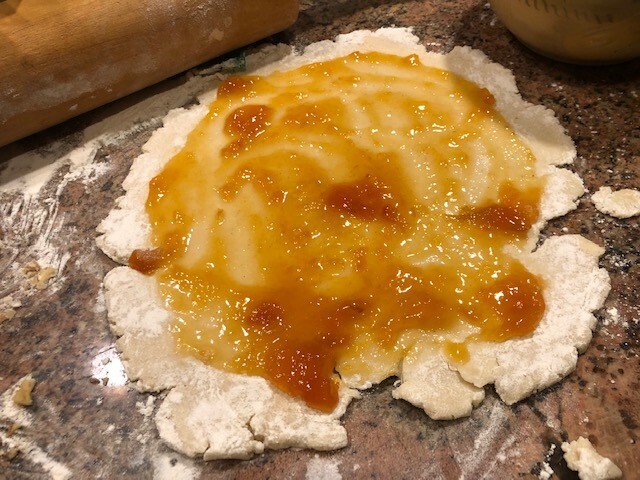 Spread 2 tablespoons of preserves on each circle. 4. 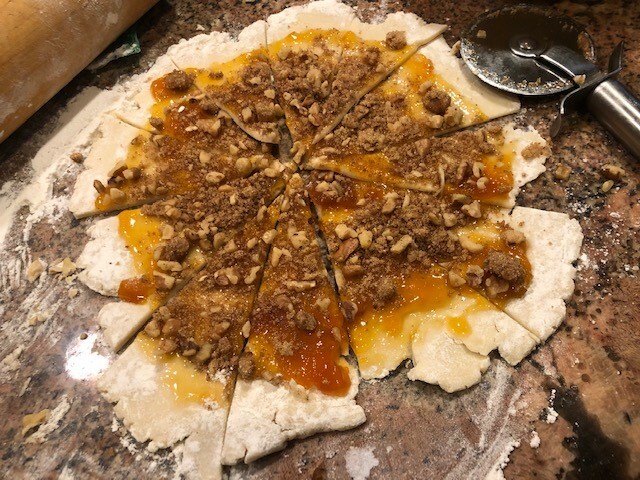 Top each circle with one quarter of the nut filling, and press into the dough slightly. This will help it from escaping while baking! 5. Cut each circle into 12 triangles (like a pizza, well, a New York one at least!). A pizza cutter works perfect for this. 6. Roll each wedge from the wide end to the point. 7. Place cookies, point side down, on a cookie sheet lined with a Silpat or parchment paper. 8. Brush with egg wash and sprinkle with cinnamon and sugar. 9. Bake for 20 minutes until golden brown. 10. As much as it pains you, you’ll want to let them cool for a few minutes to avoid molten filling burning your mouth! Whether these are for a Hannukah party, Santa, a gift for your friends, or part of a cookie exchange, they’re guaranteed to be a hit. 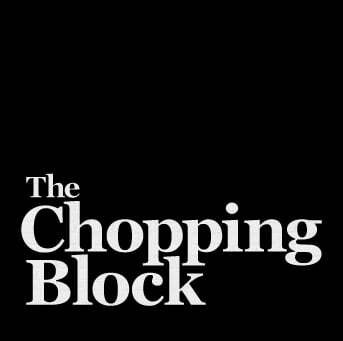 Speaking of cookie exchanges, The Chopping Block has a few incredible ones coming up! On December 9th, 16th, and 22nd, we’re opening all the kitchens at the Merchandise Mart for exchange baking and treat making. You’ll work in groups of 3-5 and make and decorate five different recipes. At the end, everyone comes together to take a few of each treat home, resulting in you leaving with over 2 dozen cookies or treats, and no dishes or flour to clean up! 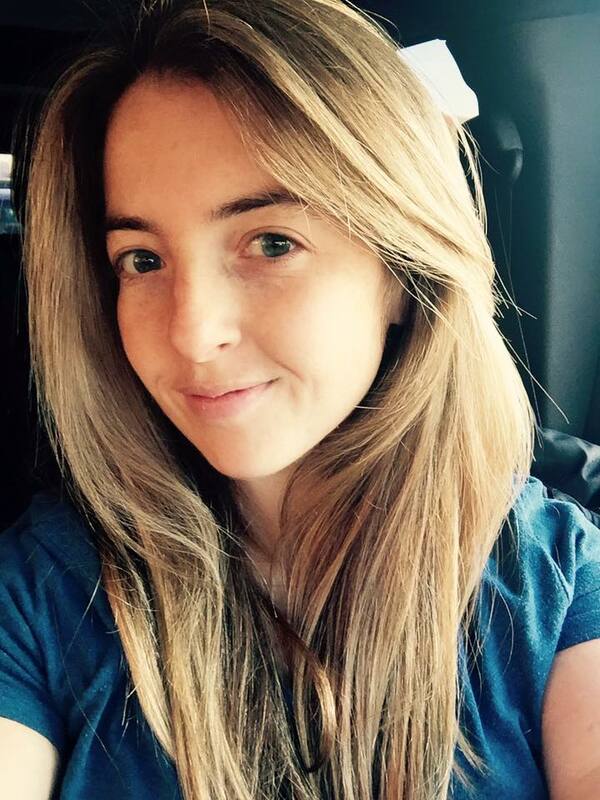 The exchanges are a ton of fun for singles or a group of friends looking to get together.